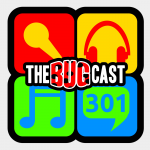 This week on The Bugcast: we celebrate our 301st episode with Dave’s choice of tracks from the last 2 years! The next show will be episode 302, which will be broadcast live in the chatroom on Friday 21 February 2014 from 21:30 (ish) UK time (UTC). Jenn Bostic for permission to play her track.